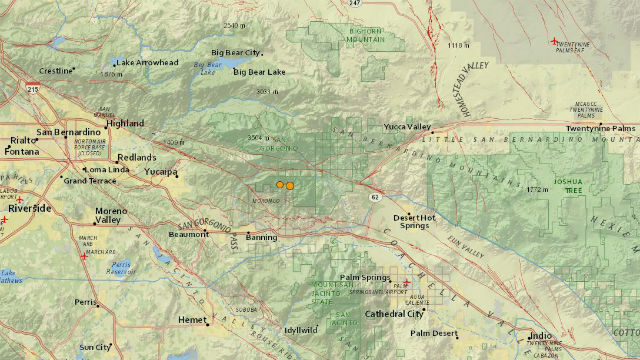 U.S. Geological Survey map shows the location of the two earthquakes. A trio of Riverside-area earthquakes — one of them strong enough to cause moderate damage — rattled communities throughout San Diego County and at least as far south as Tijuana early Tuesday, providing early wake-up calls for many sleepers but causing no reported damage or injuries. The biggest of the three temblors — a 4.5-magnitude shaker — struck at 4:49 a.m. at a depth of eight miles, according to the U.S. Geological Survey. Its epicenter was six miles south-southeast of Mount San Gorgonio and eight miles north of Cabazon. Two minutes later, a magnitude-3.2 quake occurred in the same area. Then, following about five hours of inactivity, a magnitude-2.6 temblor was recorded at 10:11 a.m., centered near where other two quakes had struck. Residents of Los Angeles, Orange County, the San Diego area and Tijuana reported being jolted awake. A City News Service reporter on the 10th floor of a downtown San Diego high-rise felt the building shudder when the first quake hit. Shortly thereafter, a San Diego Fire-Rescue Department dispatcher announced that the region had just experienced an earthquake and directed firefighters to remove all trucks, engines and other apparatus from stations across the city. “Stand by for communications with your battalion chiefs for (possible) injuries and damage assessment,” the dispatcher broadcast to all stations. No public safety agencies reported any problems related to the quakes. Residents from across Southern California and the northernmost region of Mexico went online to report the temblors, or to discuss them and crack jokes on social media. More than 6,700 people had reported feeling the earth movements by 5:30 a.m. on the official USGS website. More than 10,000 responses had been recorded by the USGS by midmorning. According to a map produced by those reports, the quake was felt as far north as Santa Clarita and Palmdale, in northern Los Angeles County, and as far south as Tijuana. The epicenter was within a region known as the San Gorgonio Knot, where numerous small faults intersect and the only part of the southern San Andreas Fault that produces smaller quakes, seismologist Lucy Jones said. Temblors of such intensity are fairly common statewide and are representative of normal California earthquake activity, she said. The epicenter of a 1986 Palm Springs quake of magnitude 5.9 — the largest in the Coachella Valley since a magnitude 6.0 quake rocked Desert Hot Springs in 1948 — was less than 10 miles east of where the most recent quakes occurred.